Issued March 2, 2004, to Nintendo Co. Ltd. 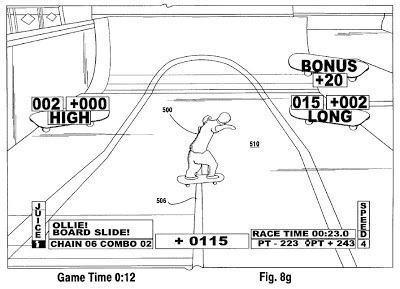 The ‘127 patents allows for real-time replay in interactive video games. The user can back up a set amount of gameplay and watch it play forward in real time. The player also has the ability to pause the replay and rotate and zoom the camera in and out to get a complete view of the player and the surrounding action. Finally, the player can adjust the playback speed and watch the previous action as slow or as fast as he wants, allowing the player full control while viewing of the previous action. Now if only Bud Selig would take the hint . . . .
1. A method of providing real-time replay during gameplay in an interactive video game system, comprising: starting real-time gameplay; recording an inline keyframe at predetermined time intervals during gameplay; recording controller input from a user during gameplay; upon selection by the user of a predetemined controller input prior to the end of a game: backing-up the gameplay a set period of gameplay time from the current gameplay condition to a previous gameplay condition; using a recorded inline keyframe generally corresponding to the previous gameplay condition and the recorded controller inputs to generate and display at least a partial real-time replay of the game from the previous gameplay condition to the current gameplay condition; and enabling the user to take over the replay to begin real-time gameplay at any time during the replay and from a point in the replay where the user has taken over the replay by supplying controller input, wherein the recordings of inline keyframes and recording of controller inputs is performed based on an internal logic rate of the video game system; and further including enabling the replay to be frozen at any time during the replay and allowing the user to change at least one of camera characteristic and playback speed for the replay while the replay is frozen, and further including recording any changes to the camera characteristic or playback speed in an array of random keyframe buffers together with information that determines on which frame of the replay the recorded changes are to take effect.